Check out our range of fun alligator facts for kids. Learn about alligator's powerful bite, how much they weigh, what they eat and much more. Read on and enjoy a variety of interesting information about alligators. There are two different species of alligator, the American alligator and the Chinese alligator. 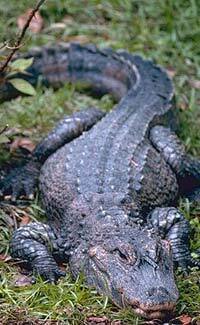 American alligators live in south-eastern areas of the United States such as Florida and Louisiana. Chinese alligators are found in the Yangtze River but they are critically endangered and only a few remain in the wild. Like other reptiles, alligators are cold-blooded. Alligators can weigh over 450 kg (1000 lb). Alligators have a powerful bite but the muscles that open the jaw are relatively weak. An adult human could hold the jaws of an alligator shut with their bare hands. Alligators eat a range of different animals such as fish, birds, turtles and even deer. Alligator eggs become male or female depending on the temperature, male in warmer temperatures and female in cooler temperatures. Like crocodiles, alligators are part of the order ‘Crocodylia’. Check out some interesting alligator and crocodile differences.